Crystal of this rare borate of which very few significant samples are known. 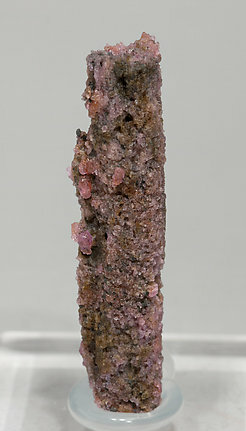 With very well defined faces and edges, the crystal shows a very well developed hexagonal prism that is almost completely coated by small crystals of red Corundum. Parallel growths of crystals that are very big and well defined for the species. 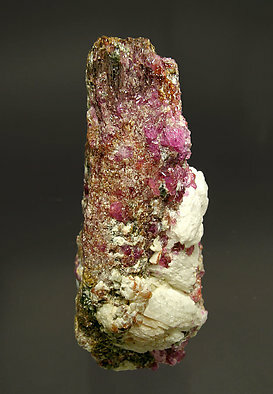 They have very good color and luster, and they are with Corundum (variety ruby) on matrix. Only a few specimens of this very rare species appeared and there were no further finds so we consider it exceptional. 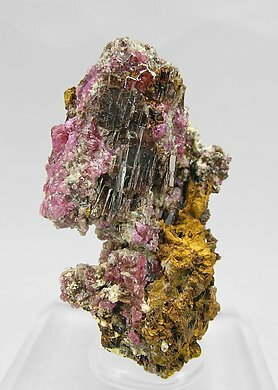 Painite is surely the most important mineralogical discovery of 2006. It is a very, very rare species and, in the past, only few pieces had been found. Recent finds in Myanmar gave some few more pieces.